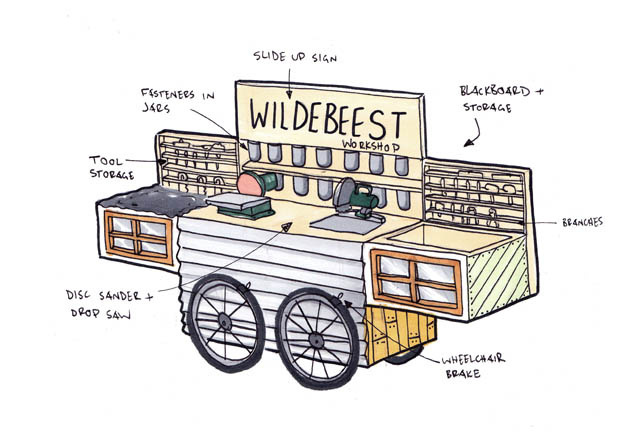 The Wildebeest workshop is a pair of movable workshop wagons designed to facilitate community building projects, travelling workshops, roving men's sheds or wandering art projects. The aim is to engourage communities to engage in hands on problem solving through skill sharing and DIY construction. The wagons were constructed entirely from found materials (mostly from an abandoned key factory around the corner). Since it's launch at the Powerhouse Museum in 2013 the wagons have helped art spaces grow, assisted in construction at community gardens, built wedding chuppahs as well as installations at art festivals. The abandoned workshop in Marrickville that proved to be a particular gold mine!